Robin Putnam, a 25-year-old college student, had a troubled mind as he traveled home to Rico, Colo., from Oakland, Calif., where he was attending art school. Putnam’s mind was likely heavy with college debt, bad job prospects and his anxiety over being unable to find an animation internship for the summer. He had also told his mother that he had been having panic attacks and so had decided to come home early before the start of the fall semester. On July 8, Putnam’s train was ahead of schedule and stopped over in Salt Lake City for a few hours. At 3 a.m., Putnam stepped off the train, leaving behind his laptop, bags, wallet and I.D., and disappeared. 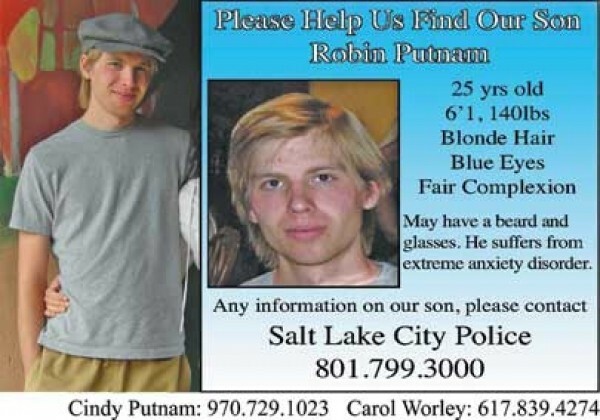 Putnam’s mother, Cindy, is agonized both by her son’s disappearance and word of her son’s fleeting appearances, with multiple accounts indicating to her that her son is alive and has chosen to make the streets of Salt Lake City his new home. “He just left everything on the train,” Cindy says. “That happened 6 1/2 weeks ago.” Since that time, Cindy and her husband, Doug, have made frequent trips to Salt Lake City, canvassing homeless shelters, mental-health facilities and area hospitals, and following up on tips from people who say they have seen Robin on the streets. Tipsters have described seeing a man fitting his description—thin, disheveled and politely refusing offers of assistance. Cindy struggles with not knowing whether her son’s disappearance is the result of mental-health issues or a sudden desire to live on the streets for spiritual or personal reasons. A train employee was said to have heard Robin speak of going on a “spiritual journey.” But Robin’s journal, recovered from the train, made no mention of anything like that, and Cindy says Robin mentioned only being eager to return home to Colorado. Salt Lake City Police Department spokesman Dennis McGowan says that the investigation is ongoing, and patrol officers are now distributing fliers with Robin’s picture on them. Cindy is concerned that her son’s talk of panic attacks in the months leading up to his disappearance may have manifested into something more serious. She says her son’s landlord told her that a few weeks before Robin’s departure, he had some kind of episode and woke her up in the middle of the night terrified and confused. Rob Butters, a University of Utah professor of social work and director of the Utah Criminal Justice Center, says runaway youth can often present a challenge for service providers who try to reach out to them, since many avoid homeless resources that would put them in touch with mental-health experts. In Robin’s case, he says, it could very well be a case of a youth wanting to live “off the grid” for the experience. However, that is not the experience of most of the homeless population, who generally suffer substance-abuse and mental-health issues, Butters says. He also says there’s the possibility that Robin could be suffering from a dissociative fugue. Robin’s parents share that worry, having heard accounts from tipsters that Robin has been seen mumbling to himself. While Robin had anxiety in high school, Cindy says it was more of shyness in social situations. “He wasn’t into the chit-chat, party social situation; he would want to sit down and have a deep conversation with you,” Cindy says. She says Robin is intensely cerebral on subjects ranging from ancient history to philosophy and physics. When the couple cleaned out his Oakland apartment, they found boxes of books, including a copy of Hermann Hesse’s Siddhartha, a novel set in India during the same time as the Buddha lived, about a character who finds enlightenment through giving up his belongings and living the ascetic life of a beggar and wanderer. It’s a story that rings true with the accounts the couple has heard of Robin living on the streets but avoiding soup kitchens and shelters and, for the most part, refusing offers of help. She says a man fitting Robin’s description was said to have been hanging around Murray City Park, where she suspects he may have been sleeping. On Aug. 8, Cindy and Doug came into town after a couple reported noticing a very thin-looking young man outside of Iggy’s Sports Grill in Sandy. Cindy says the couple identified the man as a match to Robin’s picture and told Cindy that he had refused their offers of help. She says the couple had to lie and tell him that they were leaving on a plane and would have to throw away their leftovers in order for him to accept them. If that is the case, Cindy can’t understand Robin cutting the family out of his decision. She says that if her son rationally explained to her that he wanted to live on the streets, she would respect his decision and try to give him whatever support he wants, but she needs to know. So far, the couple says, they’ve spent thousands of dollars in their search and lost countless hours of sleep to worry and long commutes between Colorado and Salt Lake City in the six weeks since Robin’s disappearance. Robin’s mother, Cindy Putnam, can be reached at 970-729-1023. She asks that people who see someone matching Robin’s description take a picture of him. He may be carrying a red and gray backpack.